These galley kitchen designs feature a variety of different kitchen styles such as traditional, contemporary, and modern. Since a galley kitchen often has a narrow space between two walls, they can be efficient for food preparation and cooking. 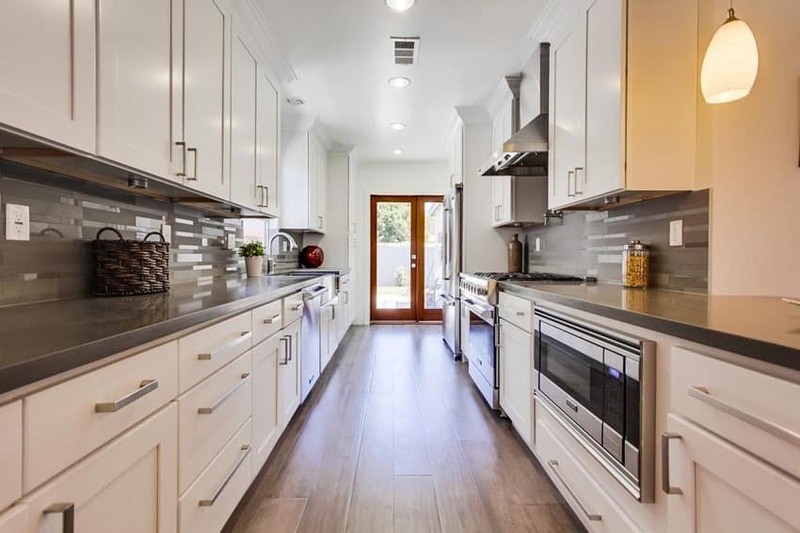 Named after a “galley” aboard a ship these types of kitchens have straight lines with emphasis on vertical cabinetry units and appliances facing each other. 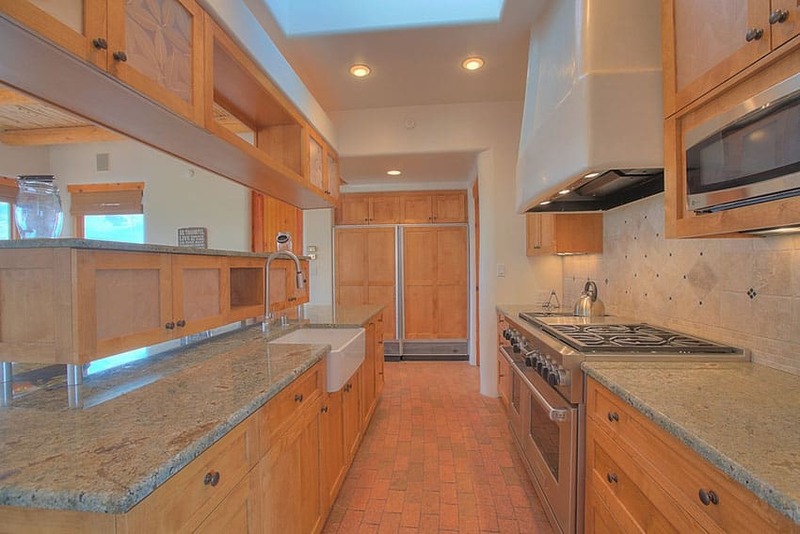 In the image above, unlike most galley kitchens, this kitchen has a bit more space in between the two parallel counters, creating a better workflow, and allowing more than one individual to use the kitchen space. The design is a pleasing combination of light and soft colors – oatmeal walls with white trims, paired with white kitchen cabinets and gray solid surface counters. It also has white beveled subway tiles for back splash to add a little more texture, and dark walnut floors, helping the lighter surfaces stand out. 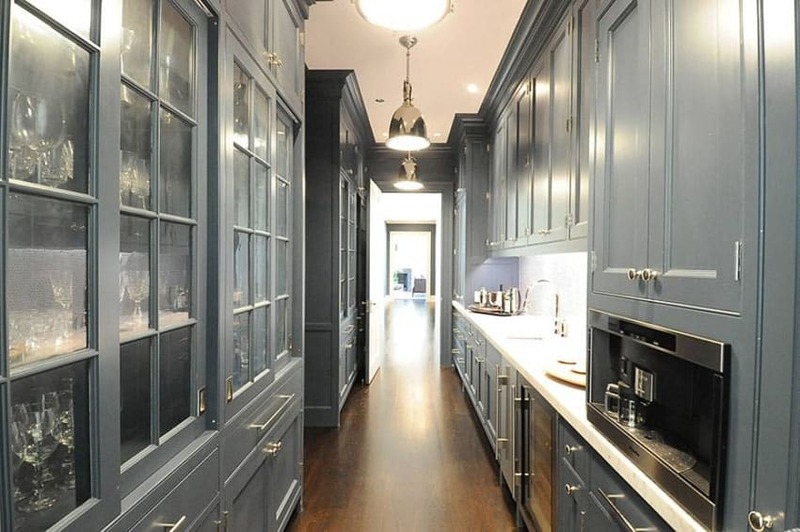 This kitchen has a bolder, more masculine appeal with its darker choice of colors. It goes for that transitional look, with its use of simplified paneled kitchen doors in a combination of gunmetal gray and white finish. 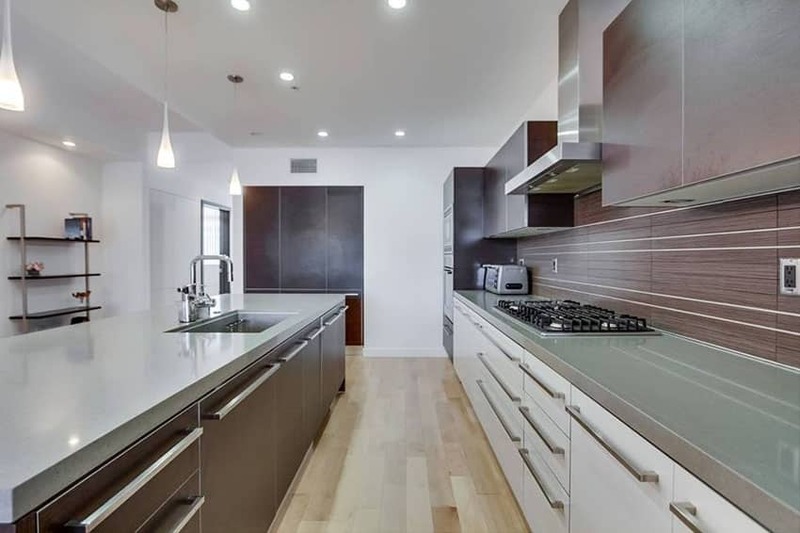 The floors are also dark, using solid dark walnut planks, while the counter top helps balance the dark colors, using off-white granite and white subway tiles for the backsplash. Galley kitchens with white cabinets can help lighten up the space. 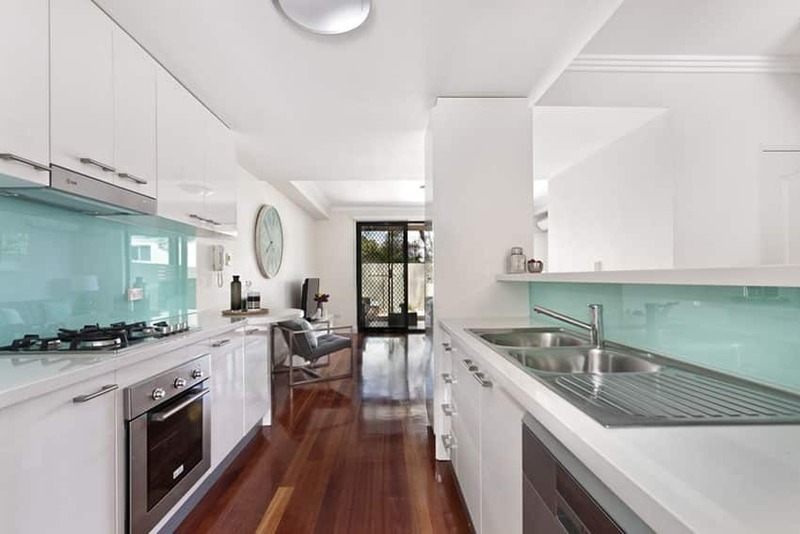 This kitchen looks bright and refreshing, standing out well against the dark mahogany floors. 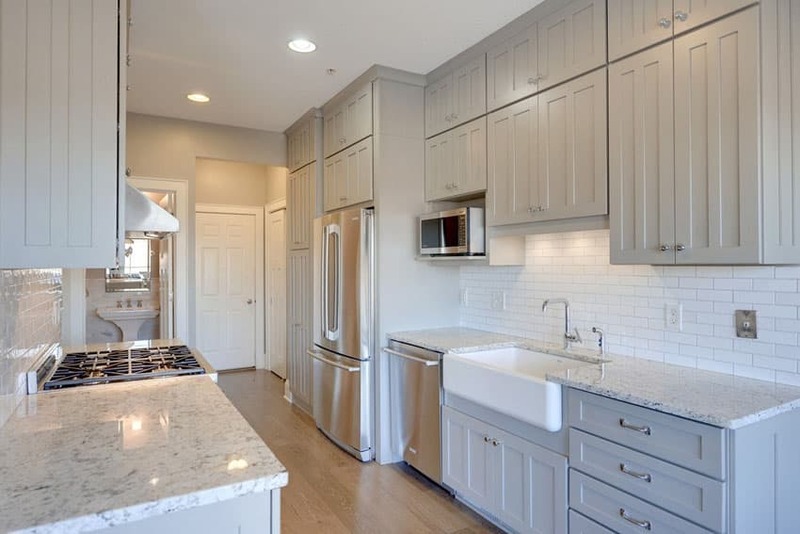 The traditional style kitchen cabinets are all in white, making a clean and crisp look, and is paired with an elegant slab of marble for both the counter top and back splash. The presence of much white elements gives this kitchen a light, yet elegant look. 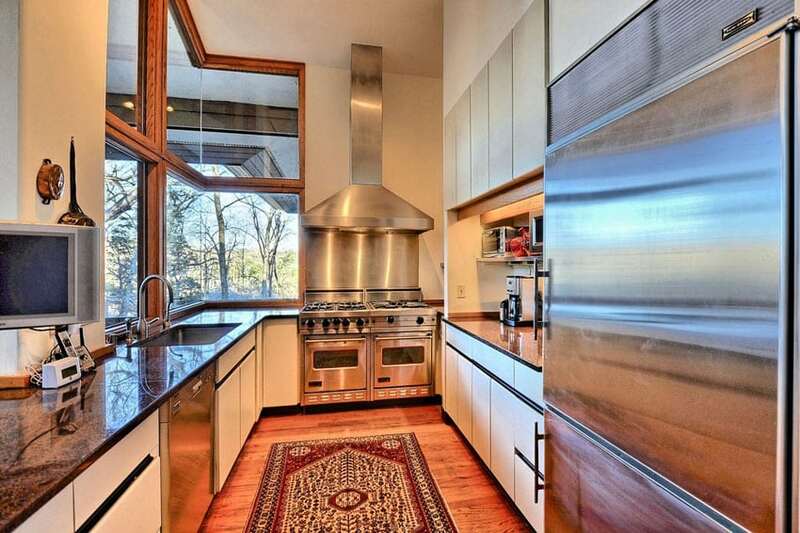 Clean, sharp edges gives this galley kitchen that crisp modern look, common in contemporary kitchens. Going for a straightforward gray and white color scheme, the result is a nice contrast without being too drastic. 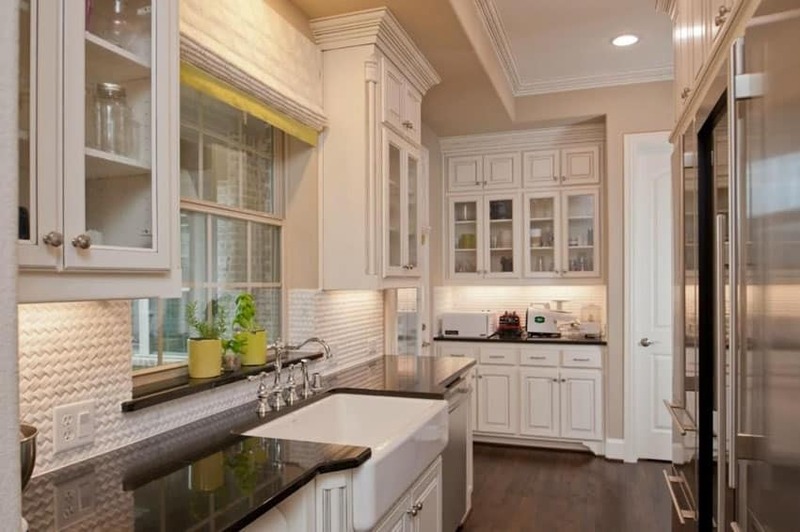 All kitchen cabinets are in white, while counters and back splash uses a dark shade of gray. Black and white color scheme is really popular with small kitchens as the whites helps create a visual illusion of a bigger space. 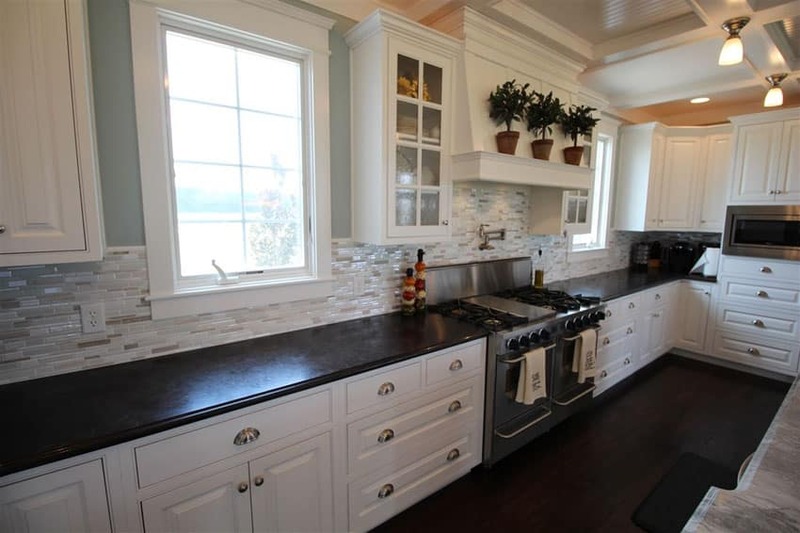 The French style kitchen cabinets gives this quaint kitchen a touch of elegance and timeless appeal, while the black granite counters and the basket-weave 3D backsplash tiles gives it a welcomed modern update. Installing glass door cabinets is a great way to create a depth perception and help the space look bigger. The sink positioned under a window allows for one to appreciate the views and help the room feel much bigger while cleaning up. For small kitchens such as this, white is an excellent color of choice for its finish, as it aids in making the small space look bigger. The cabinets used in this kitchen are paneled for a traditional look, and is paired with satin finish black granite for added contrast. The cream colored backsplash tiles helps add a subtle pattern and texture to the space, while keeping to the light color scheme of the kitchen. A contemporary country kitchen which opts for white-painted solid wood cabinets for a more modern feel. 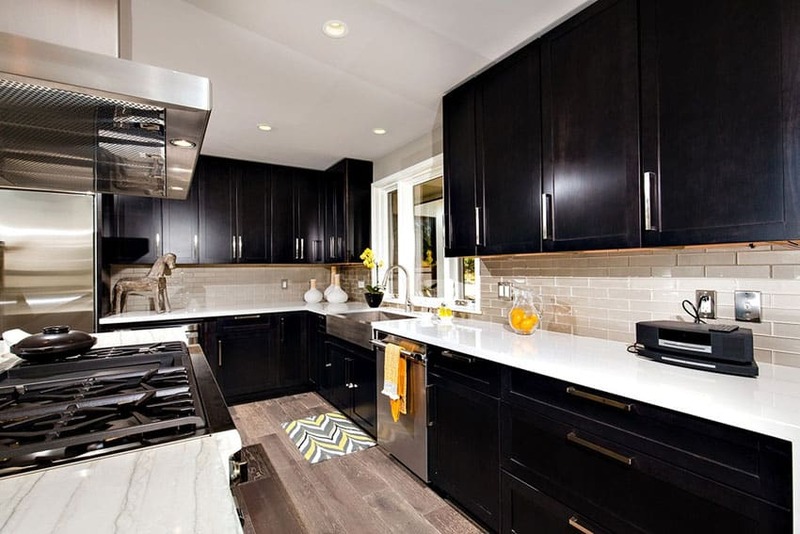 It uses satin finish black granite for its counters and 90 degree chevron pattern white subway tiles for the backsplash. The matching black antique pulls completes the country look of this kitchen. 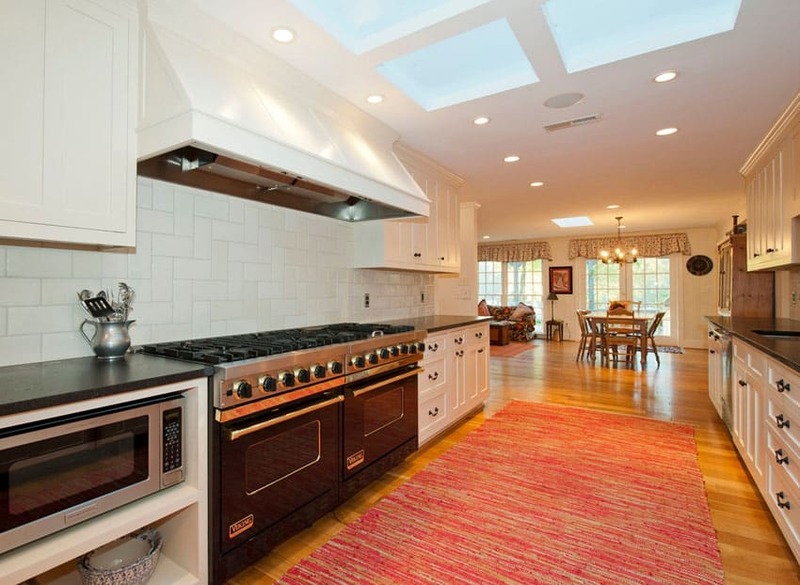 The ceiling skylight is an excellent galley kitchen idea because it lets in natural light and brightens up the space. 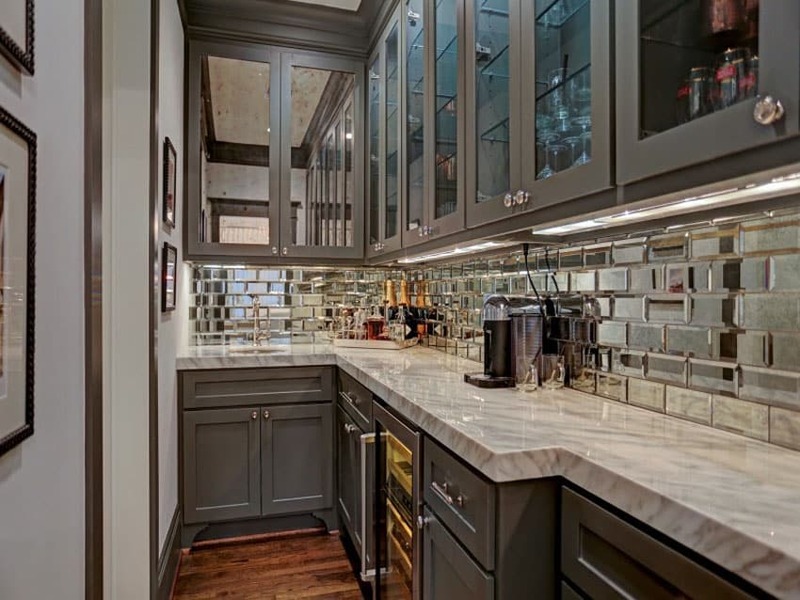 The unique element of this narrow galley kitchen would be its use of mirrors. Due to the very limited available space, the use of mirror subway tiles and cabinet doors help give an illusion of a bigger kitchen, making it look less claustrophobic. The kitchen cabinets are in gunmetal gray with a simple panel profile and topped with white marble for a modern look. 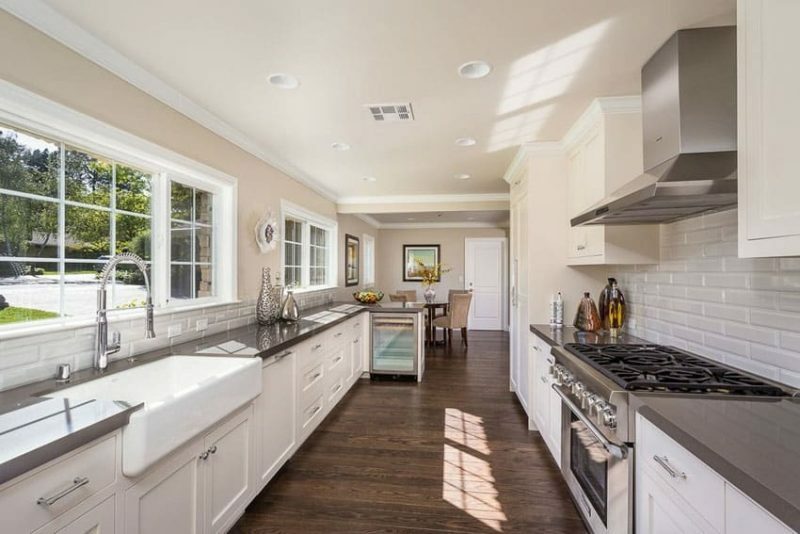 This traditional galley kitchen has gray inset cabinets with beautiful Diamond White quartz countertops and porcelain tile flooring. 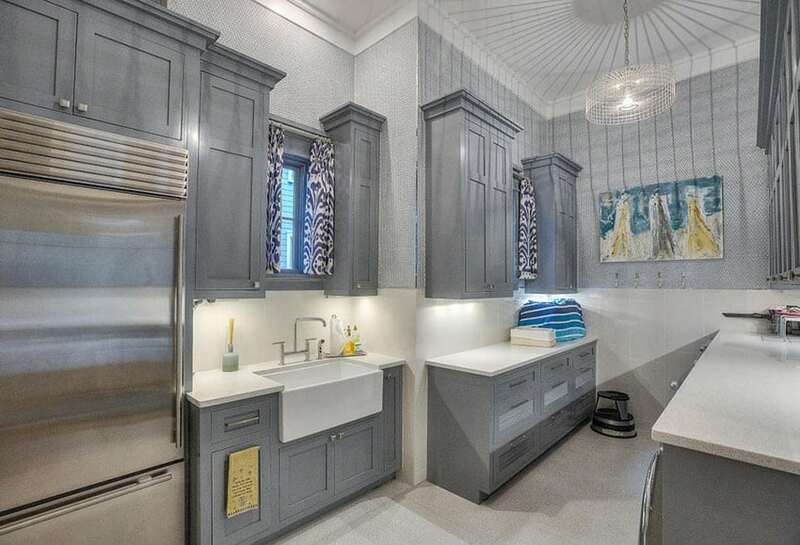 The large farmhouse sink and French style cabinets provide a real warmth to the room. Pendant lighting is a popular choice for galley kitchen lighting that can bring in light where you need it. This house has a very unique layout. The small, galley kitchen is placed beside the living area and below the elevated sitting area, in which a built-in divider slash cabinet storage was placed in between. The kitchen itself is simple and modern, with white kitchen cabinets, back splash and counter top, creating a crisp, clean look. The aqua blue back-painted glass used in the back splash of this all-white modern kitchen adds a welcomed splash of color to the space, without being overly dramatic. Since the walls, cabinets and even the counter tops are white, the bold yet soft color of the back splash is a welcomed pop of color in this modern kitchen. 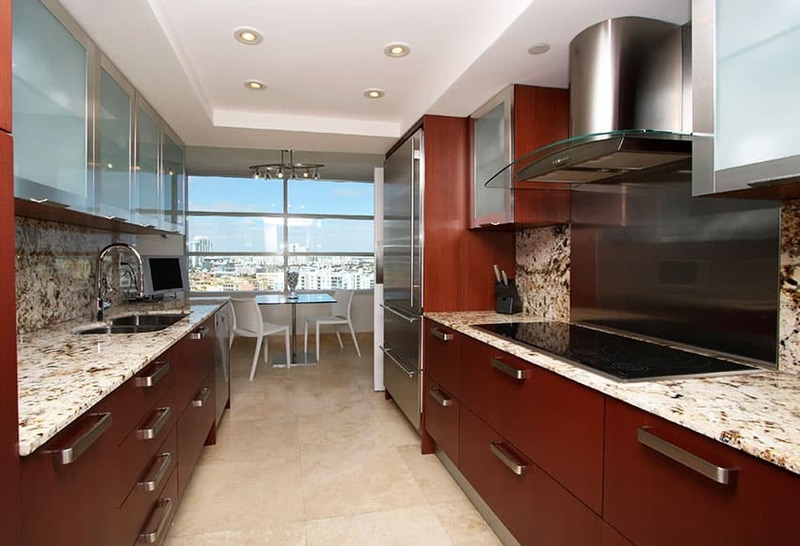 This kitchen has the best attributes of contemporary kitchen designs, creating a clean and polished look. 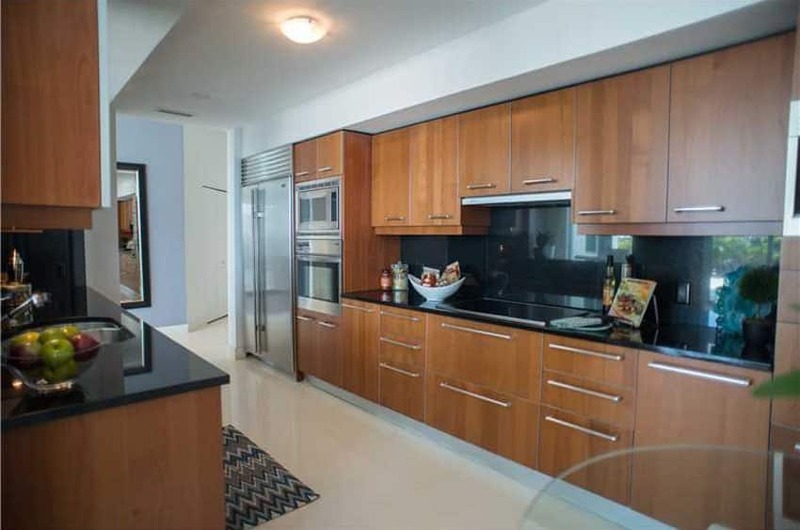 Cabinets has teak wood finish laminates framed in aluminum with matching stainless steel pulls. For the counter top and the backsplash, black granite was the material of choice for a smooth and seamless look. almost rendering the black induction cook top invisible. Another contemporary kitchen design, this kitchen uses modular cabinets with laminated finish for a cleaner, more uniform look. The laminates used is a combination of plain white laminates with stippled mahogany red laminates, framed in aluminum and topped with gray quartz counters. The galley kitchen with island has a built-in sink so one can look out while cleaning up or preparing food rather than against a wall. 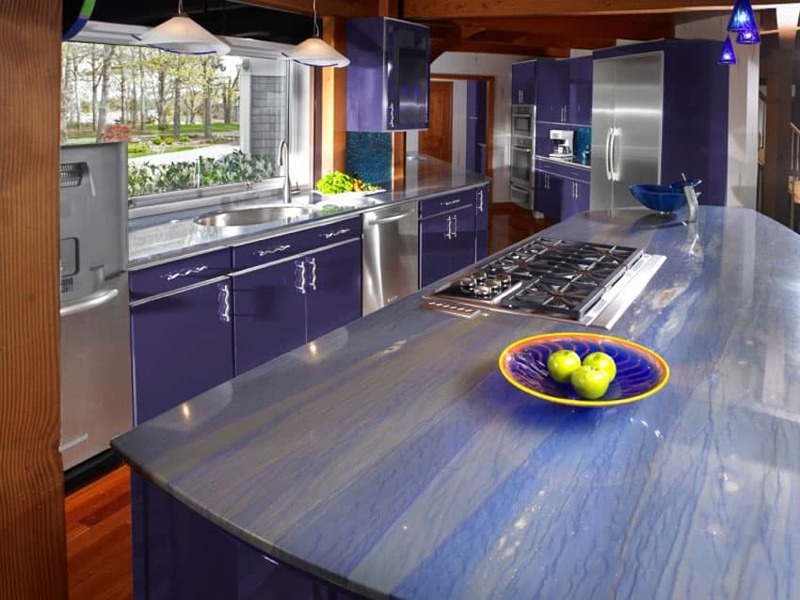 This galley kitchen has a unique choice of finish, opting for indigo-laminated kitchen cabinets with a synthetic granite counter top with lilac and purple tones. The result is a bold and fun looking kitchen space. This kitchen offers a pleasing contrast of colors and textures. Cabinets were all laminated in red wood, and this is paired with cream and brown granite counter top and backsplash, as well as glass and stainless steel cabinet doors, and stainless steel back splash for the cook top. Frosted glass cabinet doors look visually interesting and help lighten things up. Going for a contemporary French look, this traditional-inspired kitchen has the best attributes of both modern and classic design styles. The traditional kitchen cabinet profiles give the narrow kitchen an elegant look, while the slate blue paint and white solid surface counter top gives it a modern update, creating a fun and timeless kitchen design. 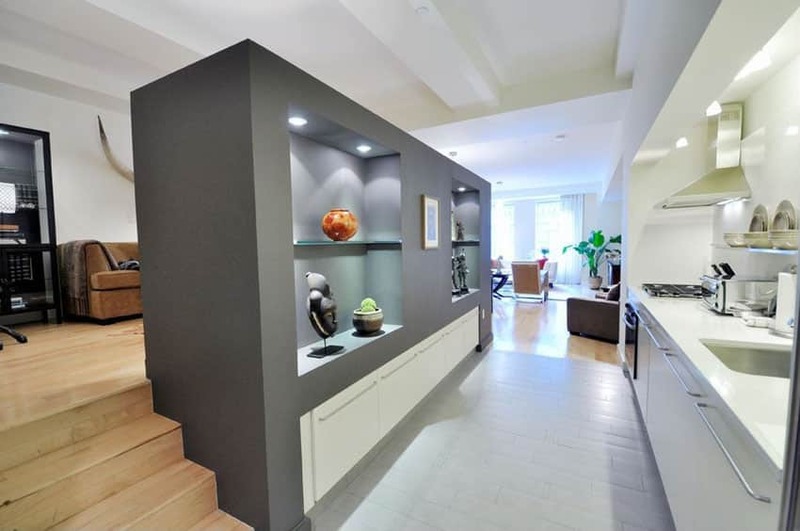 Cabinets in this narrow galley kitchen go all the way to the ceiling providing as much storage as possible in this limited corridor space. 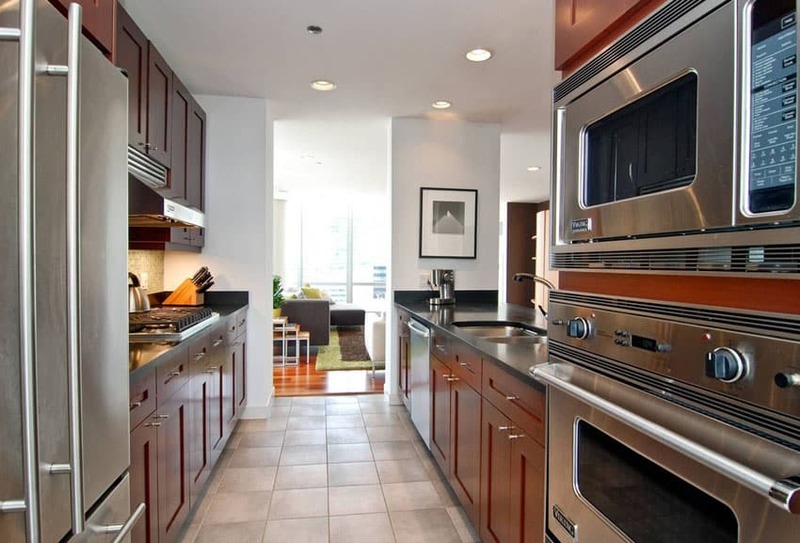 A lovely modern transitional style kitchen with an excellent combination of colors and finishes. 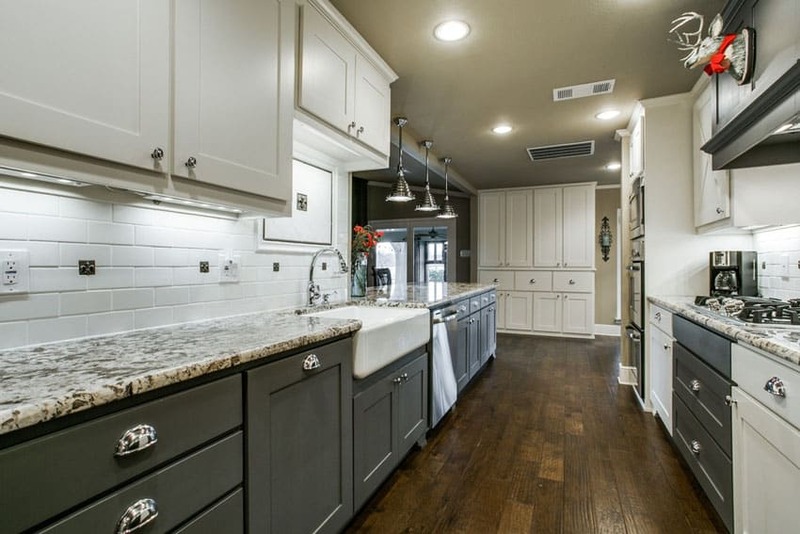 The light maple floors and light gray walls sets the mood and perfectly matches the gray-painted kitchen cabinets. Both of the parallel counters uses salt & pepper granite paired with small subway tiles to complete the look, while the large windows helps illuminate the kitchen, making it look bright and inviting. Despite being small, this kitchen has all the essentials of a kitchen and more, even having enough space for an oven tower. The kitchen cabinets uses solid mahogany, giving it a dark red tinge, and topped with black granite for an elegant contrast. A modern kitchen which aims for a more rustic look to match the over-all look of its interior space. 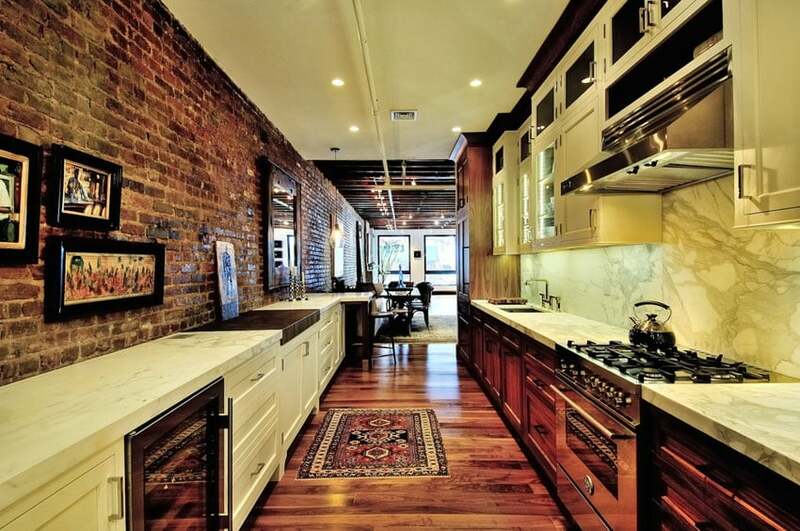 Floors are from red bricks, while walls are clean white to balance it out. The kitchen uses solid teak wood cabinets paired with dark gray granite counters and cream ceramic tiles for the back splash. The kitchen island serves not only as additional counter space, but also a divider and a bar counter in to separate the kitchen from the living area. Galley kitchen designs with a smaller layout benefit from adding texture to flooring and backsplash to add character and depth. 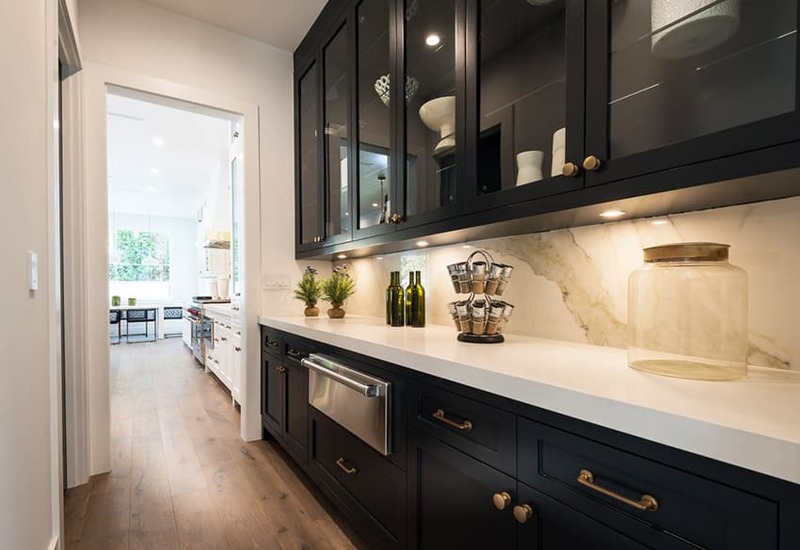 Lighter floor and wall surfaces makes it easier to use bolder and darker colors for the kitchen cabinets, and so this galley kitchen uses a dark wengue finish for its cabinets. To add contrast, white soapstone was the material of choice for the counter top, while beige glass subway tiles were used for the back splash. Rustic brick walls creates excellent rough texture and contrast against the smooth, clean surfaces of this modern galley kitchen. Placed against the brick walls for maximum effect are white base cabinets with white marble counter top, creating an excellent contrast of textures. Parallel to is are solid teak wood cabinets topped with smooth white marble counters and backsplash and white overhead cabinets. Despite the small size, this kitchen manages to fit in kitchen essentials. To help with the small space, reflective materials were preferred to give an illusion of a bigger space. The light maple laminates of the cabinets are glossy and the granite counter top and back splash are also glossy, helping reflect light as well. Large windows opening to a wonderful outdoor view helps set a rustic, natural mood in this kitchen, despite adapting a more contemporary design. Kitchen cabinets are simply laminated in pebble white for a matte effect and topped with dark red granite to add a natural tone into the space. 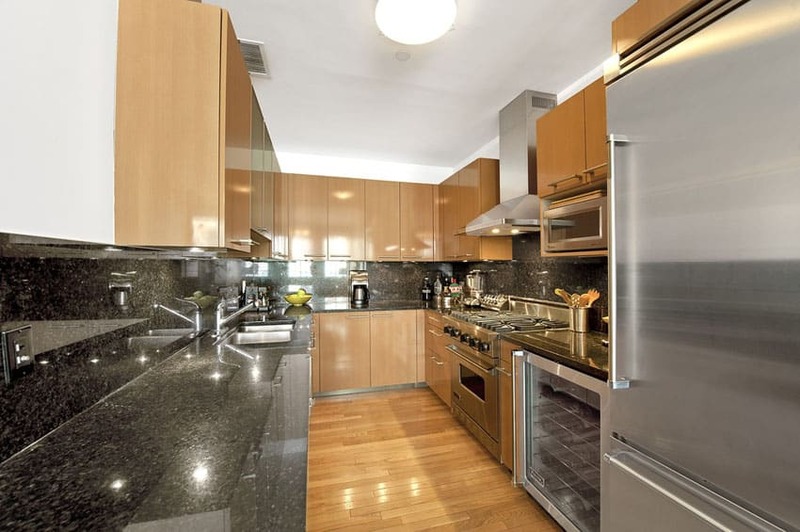 Elegance and appeal is emphasized in this rather small galley kitchen. 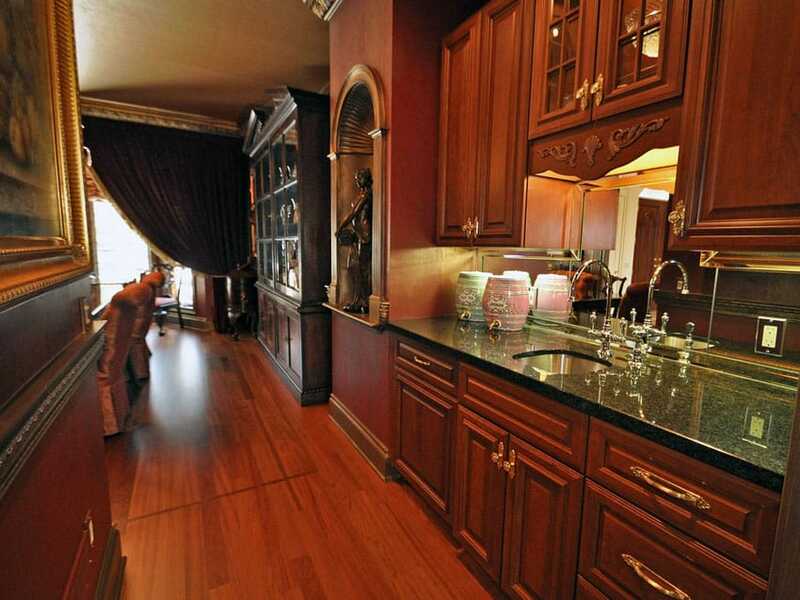 Using a traditional profile for its dark walnut cabinets, it gives that high-end classic look to the space. Black granite was the material of choice for the counter top, while mirror was used as back splash to help visually expand the small kitchen space. 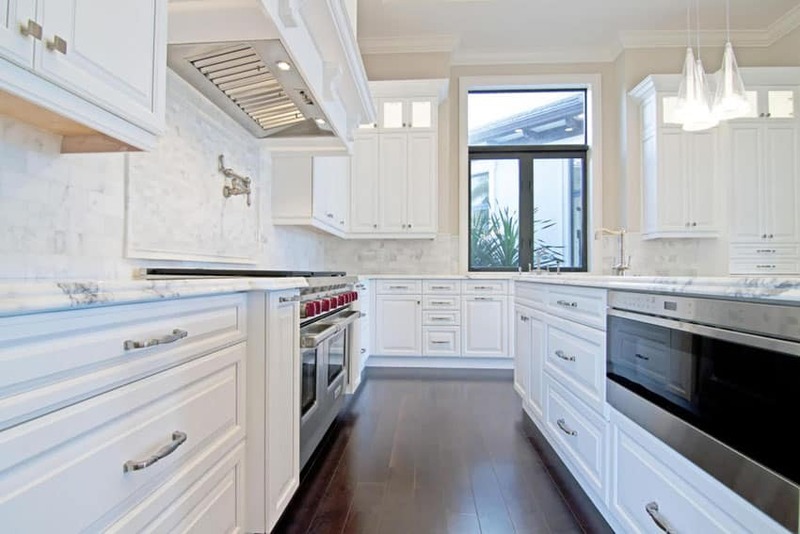 This kitchen has the elegance of traditional kitchens and the clean & crisp lines of modern kitchens. Solid wood cabinets in dark wengue finish is a stark contrast paired with the white solid surface counter top and the marble backsplash. A simple flat profile was used on the counter top for a more modern look, and the golden pulls/handles adds a retro modern touch to the space, making it look more interesting. I wish I could see 360 degree views of your ideas.